Dead Man Walking (single edit, video). 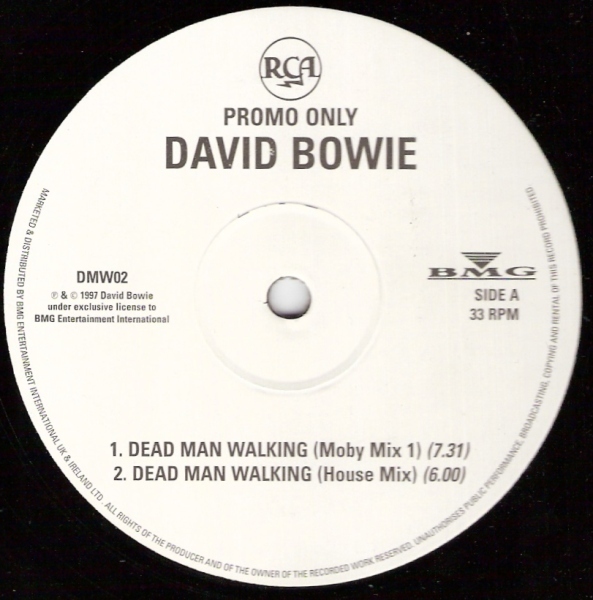 Dead Man Walking (“house” mix). Dead Man Walking (Moby Mix 1). Dead Man Walking (Moby Mix 2). Dead Man Walking (Top of the Pops, 1997). Dead Man Walking (Late Night with Conan O’Brien, 1997). Dead Man Walking (Jack Docherty Show, 1997). Dead Man Walking (acoustic w/ Gabrels, radio, 1997). Dead Man Walking (acoustic w/ Gabrels, Live 105, 1997). Dead Man Walking (live, 1997). People my age, they don’t do the things I do. He idly considered writing an ode to his former co-star Susan Sarandon, using as a kick-off point the title of her most recent film. But upon seeing Neil Young and Crazy Horse play one night,* Bowie found “Dead Man Walking” better suited someone who’d become the California redwood of rock musicians. Like Bowie, Young’s finest work came in the Seventies; unlike Bowie, his Eighties were commercially barren, his records seemed willfully obscure. In his crooked way, Young was doing what Bowie had tried with his “Berlin” records—to erase a persona that he felt trapped in. While in the Seventies he’d slaved to be contrarian, driving “into the ditch” after a time in the middle of the road, Young still mainly played two alternating roles: heavy rocker and somber folkie. 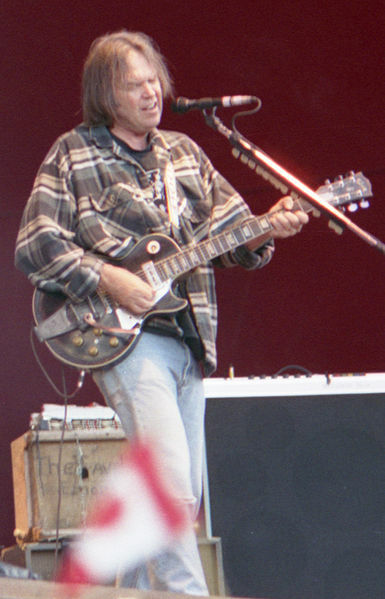 So in the Eighties he rubbished the idea of “Neil Young.” He made a synthesizer album, a country record, a blues-bar album and a Fifties rock ‘n’ roll tribute LP that led his label’s head David Geffen to sue him for making “unrepresentative” albums. Around the turn of the Nineties, Young seemed to settle on being “himself” again and soon was anointed the only Baby Boomer musician who wasn’t a joke. He was slower, craggier, he looked like someone’s hippie dad, stumping around on stage. But he became immaculately hip, recording with Pearl Jam, touring with Sonic Youth; he seemed more of the time than his counterparts a generation younger. What Bowie seemed hell-bent on being in the Nineties—a 50-year-old rocker who was still in the bloodstream of current music—Young simply was. And he did this not by playing drum ‘n’ bass or Pixies riffs, but the same old first-gear/second-gear grind, feedback-bloodied, juddering, two-guitars-bass-drums music that he’d played in the Sixties. He had stood still and the world had revolved back around to him. Bowie was taken by the idea of Young as some kind of shaman figure for audiences half his age. Watching Young and his old bandmates in Crazy Horse channel music seemingly through their bodies, he thought “there was a sense of grace and dignity about what they were doing, and also an incredible verve and energy. It was very moving, watching them work under the moon,” he said. And the boys that we were.. So one tributary of “Dead Man Walking” began the night Bowie saw Young play. Another was a far older stream, starting in a London studio one day in January 1965. Two ambitious young men are in the room that day: one is an 18-year-old from Bromley who’s cutting his second-ever single, a muddled cover of Bobby Bland’s “I Pity the Fool.” The other, despite being just 21, is a storied professional guitarist, a studio hired gun who quietly exudes cool and who’s happy to show off his latest gear: in this case, a fuzzbox. So David Jones sings “Pity the Fool,” and Jimmy Page doubles on lead for it. Page doesn’t think it’s a hit, and it isn’t. As if in recompense he plays Jones a riff that he’s not going to use. It’s a lumbering sway between two chords, a brontosaurus stomp. Duh-nuh duh-nuh dunna-nuh duh-nuh. Page doesn’t realize just how much of a packrat he’s talking to. Jones will keep the riff in his head: he’ll use it on “The Supermen” five years later, then he’ll revive it in another lifetime, in New York in 1996. In its old age, Page’s riff was still basically the same: E-flat and F major, a steady foot-clomp of harmonic rhythm. But on the studio take of “Dead Man Walking,” the riff is a beast in a cage. It collides with a second Reeves Gabrels synthesized guitar line, which buzzes along and jabs at it. Its rhythms are overwhelmed by synthesizer arpeggios, tea-kettle feedback noises, various percussive loops. Yet despite this it still has its power: whenever the riff plays to close out a chorus, it’s a gavel pounding, making the other jabbering voices fall in line for a moment. “Dead Man Walking” was nearly abandoned during the Earthling sessions until the co-producer Mark Plati spent five days salvaging the song, painstakingly putting a mix together that was built on a dramatic arc. As Plati said, the track “begins completely programmed and ends completely live.” It opens with solitary synthesizer flourishes and ends with the sound of live musicians making themselves heard above the din: Zachary Alford’s snare fills and hissing cymbals, Gail Ann Dorsey’s bass (she’s often gliding between notes, as if looking to outflank the rest of the band, and while she holds back during Alford’s solo, she slides in afterward and lays down a sinuous foundation for the outro) and Mike Garson, who closes out the song by playing a new, Latin-sounding melody on his piano, as if saying: no, look we could go here now just at the fade. It’s bluster, playing japes: he can’t shed the weight of the past. He’ll wake up in his torn Union Jack coat and dried makeup and feel the hangover deep in his bones. 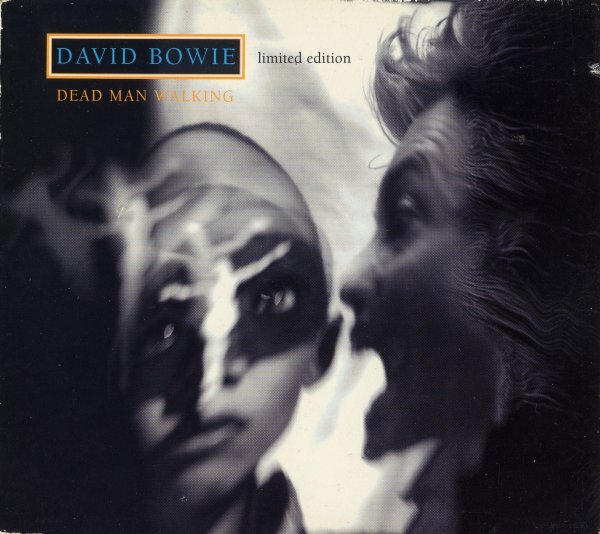 (This is essentially the acoustic revision of “Dead Man Walking” that Bowie and Gabrels played for a number of TV and radio spots in 1997. It’s lovely and graceful but it’s an old man’s song now.) The chorus lines subtly acknowledge this, with their echoes of Young’s “Sleeps With Angels” (a man mourning a kid who took his old path and went astray) and, in perhaps the ultimate Bowie in-joke, his lost “Shilling the Rubes,” where a woman is played for a sucker by a man who’s skipped out on her (“Gone! the day he left town!”) The title line itself is a cruel joke: he’s escaped the past and wound up a zombie. But there are a few moments in the song—whenever the riff’s playing (it’s like an extended middle finger pointed at time) or during Gabrels’ jabbing solo that has him relentlessly moving down his guitar neck, or when Alford slips in a sharp little tom-snare fill (4:52)—when Bowie seems free, when he’s gone lighter than air, toe-tapping on an angel’s head. It’s a youth of the mind, sure, but that’s really all youth ever was. Recorded August 1996, Looking Glass Studios, NYC. Released as Earthling‘s third single in April 1997 (RCA 74321 475842, #32 UK). The single mix lops four lines from the pre-chorus (moving from “older than movies” straight to “And I know who’s there”), which does get to the chorus hook faster (Bowie used this edit for his acoustic versions as well), but diminishes the narrative of the song—its pleasures come a bit too easily. There were a mind-fogging array of mixes. In Britain, there was a 12″ single with the House Mix and the Vigor Mortis remix (BMG/RCA 74321 475841 (oh, for the sunny days of “BOW 5″) as well as a promo single (RCA/BMG DMW02) that had the Moby Mix 1, the This One’s Not Dead Yet Remix as well as the two previous mixes. The EC and the US offered different variations, including a Moby Mix 2 on a US promo 12” that was later included on the 2004 reissue of Earthling. There were three acoustic versions of the song broadcast in 1997 subsequently issued on CD (including the Conan O’Brien performance): please see the Illustrated DB entry for more details. * Bowie claimed this was the Bridge Benefit Concert that he’d played with Young in October 1996. However, Earthling was mainly cut in August 1996. So perhaps Bowie rewrote the lyric to “Dead Man” after the Bridge show, or in interviews he confused that show with his memories of an earlier Young concert, or he was just making it up. All seem plausible.